Initially, Demeulemeester showed no interest in fashion. She attended art school for three years, where she discovered her fascination with people and portraiture. From this, she went on to study fashion design at the Royal Academy of Fine Arts. In 1986, she and her fellow students showcased their collections in London. As a result, she is often referred to as part of the 'Antwerp Six', the radical and distinctive Belgian designers of the 80s, known for their distinct styles of creating untraditional clothing lines. Demeulemeester’s silhouettes are typified by contrast: smooth and extensively treated leather is often juxtaposed against heavy woolen sections. She also enjoys incorporating masculine and feminine shapes into one and the same outfit. A Time Magazine fashion reporter once described Demeulemeester's garments as exuding “a very great deal of genuineness”. Demeulemeester herself remains modest: “I like simple silhouettes. In much the same way as I would wrap a table, I want to wrap girls”. 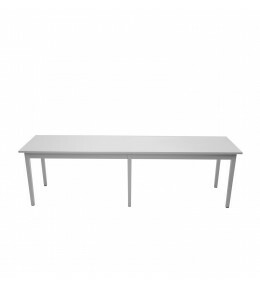 Table Blanche, designed by Ann Demeulemeester, comes available in a large and small version.